4. Instantly secure the mouth guard by pressing tongue against the back of the upper teeth and press mouth guard with thumbs into upper teeth. 6. Remove mouth guard and place in cold water to let the material harden. 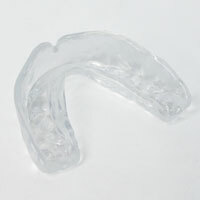 Basic mouth guard that fits great, and is a very good value. Definitely recommend. It is cheap, but very soft and easy to use! highly recommended!